Madagascar Hissing Cockroaches are known for the hissing sound they can make, hence the name, and it happens in a rather odd way. They force air through spiracles, respiratory openings, on their abdomen. This hiss can be made to suit three different situations: disturbance, mating and fighting, but only males use the latter two. Another distinction between the two genders is the thicker antennae found on males. Unlike most cockroaches, these are wingless. Despite this, they are very good at climbing and can even make it up smooth glass. 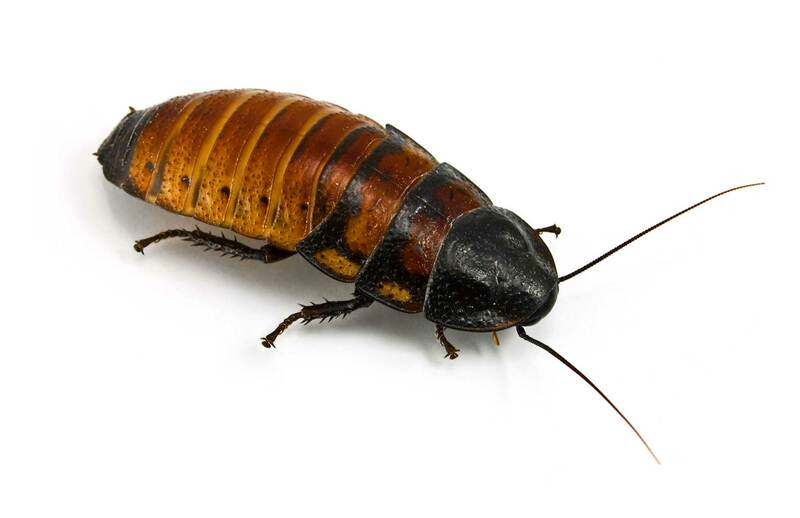 An adult Madagascar hissing cockroach will require at least a 5-gallon aquarium. Suitable substrate for Madagascar hissing cockroaches is peat moss with dark idling places. They are indigenouse to tropical rain forest areas of Madagascar; therefore, it's crucial that they be provided a temperature range of 77°-82°F during the day and mid to high 70°F at night. This is necessary for the metabolism and immune system to function properly. If you want to induce breeding, keep low to mid 80°F. They should also be kept at moderate to high levels of humidity. To ensure proper humidity levels, the enclosure should be misted with water every other day. The roaches are herbivores, with a diet consisting of dark greens, such as pesticide-free romaine lettuce and dandelions. A small shallow bowl with a saturated cotton ball inside should be included for water.